As we head back into St. Louis this weekend to attend another wedding (seems like we do that most years on our anniversary), I'm excited to get to hear wedding vows. No matter who's getting married, I can't help but remember the joy I felt during our ceremony. 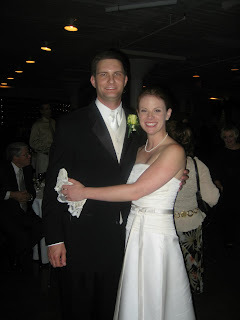 It's amazing to me that that was only four years ago... we've only been married for four years! Honestly, it feels like we've been together forever ~ and I mean that in the best way possible. I can't imagine my life without him. I'm excited to admit that I FINALLY think like a member of a team. Yes, it's taken me this long. NO JUDGING. I'm excited to see what God has in store for us over the next 50 odd years. Though, truth be told, I'd be content with a few quiet years on the heels of all this craziness. We've definitely had some ups and whole lot of downs. Our marriage is far from perfect so I'm certain there will be more tough times. But, I know regardless of what is in store for us, together we will survive. That assurance is the best anniversary present that I could ever hope to receive. OK, I promise this is the end of the mushy love posts all about my hubby.